Finland Philosophy is the official app introducing and helping you choose among all new Finnish saunas, Harvia sauna accessories, stoves, heaters and Turkish bath equipment available on the Finlandphilosophy.com website. iPad: download the free app for iPad on the iTunes App store. iPhone: download the free app for iPhone on the iTunes App store. The Finland Philosophy App is also avaiable for Android's tablet and mobile! Android: download the free application for Android in Google Play Store. 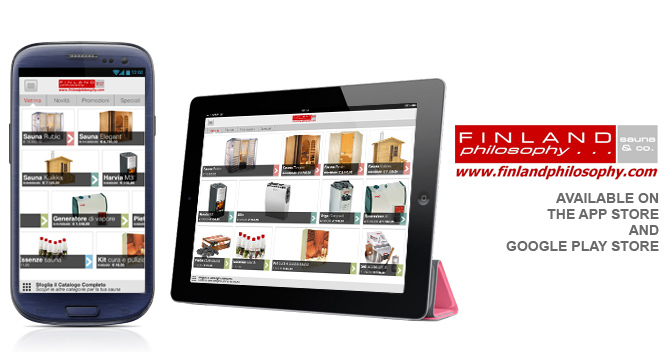 In this app you’ll find Finland Philosophy customized solutions, projects realized around the world, and the testimonials of Finland Philosophy’s customers, who have chosen our products for their homes and spas. In case of viewing problems or if you have any development suggestions, Finland Philosophy kindly asks you to submit a message to app@finlandphilosophy.com. Download App in iTunes Store. Download application in Google Play Store.